Part I of this series discussed the misinformation being circulated in Florida by anti-fracking activists like Floridians Against Fracking (FAF) regarding the potential impacts of fracking on groundwater, air quality and public health. In Part II, we’ll take a closer look at their claims surrounding possible impacts to habitats from land clearing, the potential for earthquakes and negative impacts to Florida’s tourism industry. It is once again important to note that while fracking has been a routine activity in many parts of the country for more than 60 years it is not currently being used in the Sunshine State, where the oil and gas industry has been safely operating for decades. Let’s dive into some more of FAF’s claims and compare them to the facts. CLAIM: Fracking negatively impacts habitats by clearing large tracts of land for operations. FAF: Fracking causes environmental disturbances due to land clearing and drilling. FACT: FAF suggests fracking in Florida would have an unprecedented impact on habitats in the state — as if the development of natural resources in Florida is a seemingly unchartered and dangerous prospect. This couldn’t be further from the truth. Florida has been responsibly developing its oil, and to a lesser extent natural gas, since the 1940’s. In fact, even though Florida’s wells aren’t typically considered part of the modern, unconventional shale plays often associated with fracking, they do have some similarities. For instance, Florida’s oil and gas industry is well ahead of the game when it comes to decreasing its environmental footprint by using directional or horizontal drilling on most of its wells. Florida producers have been using horizontal drilling techniques in the Sunniland formation for nearly 20 years. 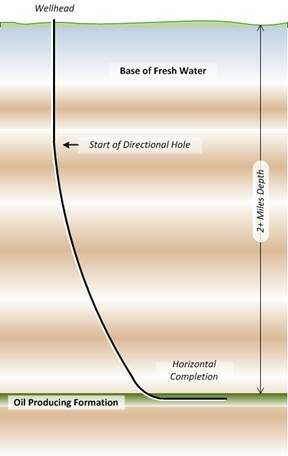 Directional drilling allows producers to drill multiple wellbores from one location or pad instead of drilling vertical wellbores from multiple locations, greatly limiting the amount of land needed for an operation and the traffic and impact on flora and fauna that is inherent with any human activity. What’s more, the industry has been successful in developing its natural resources in places like Big Cypress Natural Preserve (BCNP) without having detrimental impacts to the unique habitats there. BCNP has been home to energy production since 1972. Alongside hundreds of plants and animal species, BCNP is also home to 40 oil wells, or approximately 24 percent of the state’s oil wells. This is true in Florida and in other parts of the country as well. FAF: Studies show that fracking of rock increases seismic activity. FACT: Earthquakes (“induced seismicity”) and whether or not a link to fracking exists, is a subject that has been carefully studied by scientists, geologists and government agencies. “In the United States, fracking is not causing most of the induced earthquakes. Wastewater disposal is the primary cause of the recent increase in earthquakes in the central United States. So, no — fracking is not causing earthquakes across the country, and it is highly unlikely the practice would result in any seismic activity in Florida. There are some existing injection wells in Florida and they are not causing any seismic activity. It is very unlikely they will suddenly begin to do so. CLAIM: Fracking negatively impacts the economy, especially the tourism industry. FAF: Our state is dependent on tourism as an economic driver. Allowing drilling on our lands puts our economy at risk too. Facts: Florida’s energy and tourism industries have coexisted happily for more than 70 years, without negative impacts on the tourism industry. Walt Disney World — the most visited vacation resort in the world — was founded in 1971. That’s 30 years after Florida began drilling for oil and gas. Tourism and energy production are both critical to Florida’s diverse economy. They both provide the state with billions of dollars in revenue and hundreds of thousands of citizens with jobs. So, FAF’s claim that “allowing drilling on our lands puts our economy at risk…” doesn’t make sense. Two economically beneficial sectors help lift all boats. And that’s true across the country. A 2013 study found that the energy industry provides counties with more flexibility to put money into amenities that would be important for tourism. Would fracking change the current relationship of Florida’s energy and tourism industries? If other plays and Florida’s own history are any indicator, it would only help for the better. Activists like FAF are flooding Florida with misinformation about fracking, and in doing so, falsely characterizing an industry that has safely operated in the state for decades. But arming people with fear, rather than facts, is counterproductive in the effort to craft a sensible, science-based energy policy for Florida that protects our environment and creates jobs and economic growth that benefit all Floridians.